Root canal therapy (called endodontic therapy by dentists) is necessary after a cavity has gone untreated for an extended period of time. An untreated cavity will eventually begin to cause decay in the pulp tissue of the tooth. This decay can even extend through the root and down into the surrounding bone structure. Ultimately, this will have serious consequences in the way of major pain and possible health issues in the rest of your body. Infected pulp tissue will not heal on its own. This is when a dentist will need to perform root canal therapy on the infected pulp, the root, and down into the tooth canal. This is really the dentist’s last option to prevent the necessity of a tooth extraction. 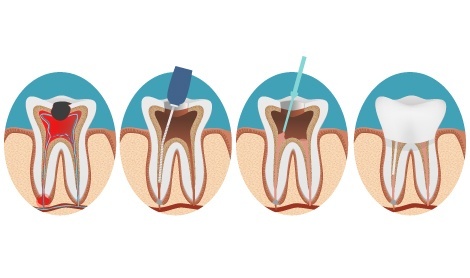 After the dentist has removed the infected tissue, he will fill the tooth canal in order to protect the tooth against repeated infection in the future. Usually, he will need to follow the root canal with a core build up and a crown for additional strength and protection to the tooth. An infected tooth pulp will be recognizable by symptoms such as extra sensitivity to extreme temperatures, extra sensitivity to sugar-filled foods, intense pain, swelling, pain from the pressure of biting, or possibly a bad taste in the mouth of the patient. However, it is important to note that an infected pulp area may exhibit no noticeable symptoms and may only be discovered by a check up at the dentist office. Traditionally, most patients shy away from any possibility of a root canal. It is crucial that patients understand that a root canal is a beneficial tool that is available. It may be the only way that your dentist can resolve your extreme pain, deal with the infection, and still preserve your natural teeth. A skilled dentist with good training and experience will be able to conduct a root canal with nearly no pain.